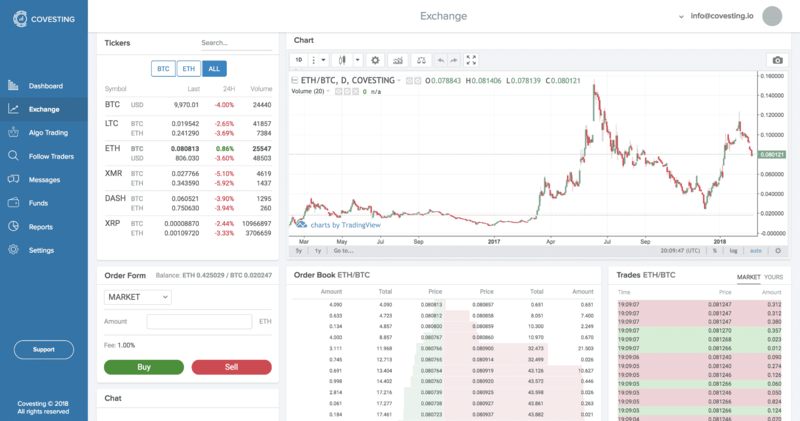 Covesting, a copy-trading platform for cryptocurrency market, has provided the first glimpse into its new interface, having already succeeded in attracting top trading talent over the past month. Covesting has also grown into a true all-inclusive platform, combining infrastructure for investors and cryptocurrency trading, while also offering its own exchange, liquidity aggregation, algorithmic trading, and many more capabilities. Moreover, Covesting has planned for the rollout of its platform in Q1 2018, which managed to already receive over 1200 applicants from leading professional crypto traders. Its intuitive platform figures to build off the success of Covesting’s previous developments, which underwent a highly successful Q4 2017. This included its initial-coin-offering (ICO) last December, the deployment of its Crypto Intelligence Portal, as well as its recruitment strategy that saw veteran Saxo Bank executives, Kurt Carlsson and Peter Kristenson join its ranks. With so many crypto trading platforms available on the market, it’s difficult to select the right one amidst a sea of competitors. For Covesting’s part, its new platform helps enable everyday investors to search and compare the performance of hundreds of proven crypto currency traders and mirror their trades automatically. Copy trading has been one of the most popular investment strategies in FX and equities space, which is only now making its way into the realm of crypto. In this mutually beneficial ecosystem, any individual can launch a career as a successful asset manager and earn success fees by allowing investors copy his or her trading activity. By extension, investors of all skill levels and expertise will be able to take advantage of the unified wisdom and experience of professional traders in order to capitalize on the volatility of crypto markets. Covesting’s platform looms as particularly relevant given the recent turbulent nature of crypto markets, which since December 2017 have been seen no shortage of big moves. 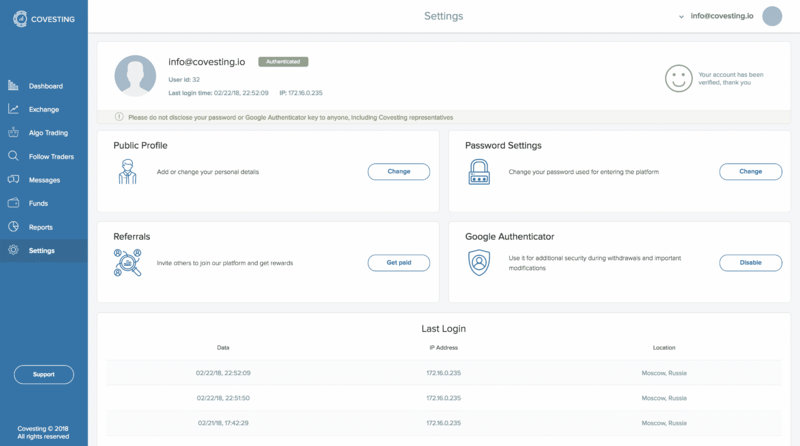 Users can familiarize themselves with Covesting’s new platform interface by browsing through its diverse Settings, which they can then use to enter and verify their account. Of note, all this information is cleared by Covesting’s compliance team with the referrals option allowing users to invite others to join the platform, consequently receiving a lucrative reward in return. Covesting’s platform users can also start by transferring their funds to the module after a short verification process. 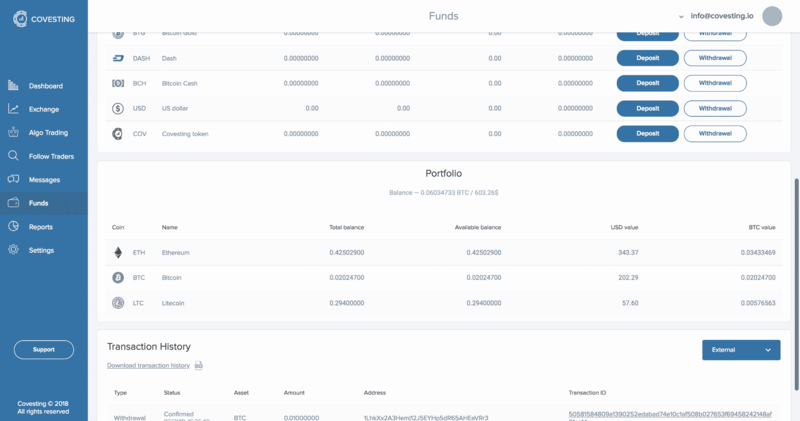 Users can choose from a variety of different account functions, including detailed information on wallet holdings, current portfolio assets, and their value in USD and BTC, as well as transaction history available in the Funds section. Moving forward, Covesting will be providing additional payment methods such as Visa and MasterCard, as well as bank wires. This interface is where all users will be able to easily transfer funds to the platform’s wallet from their respective exchanges and vice versa. Knowledge is power and with Covesting’s platform users will be able to track their portfolio performance or check their growing following. 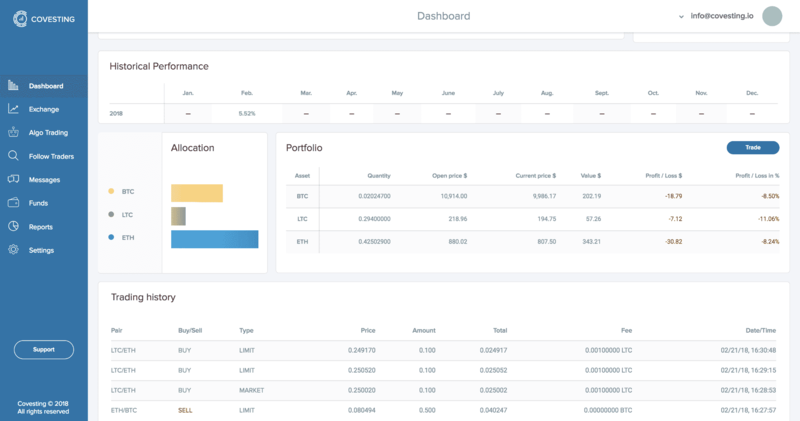 All of these functions can be performed on the Dashboard, with access to charts showing historical performance, and portfolio allocation over customizable intervals. This section is one of the most important elements on the entire platform. 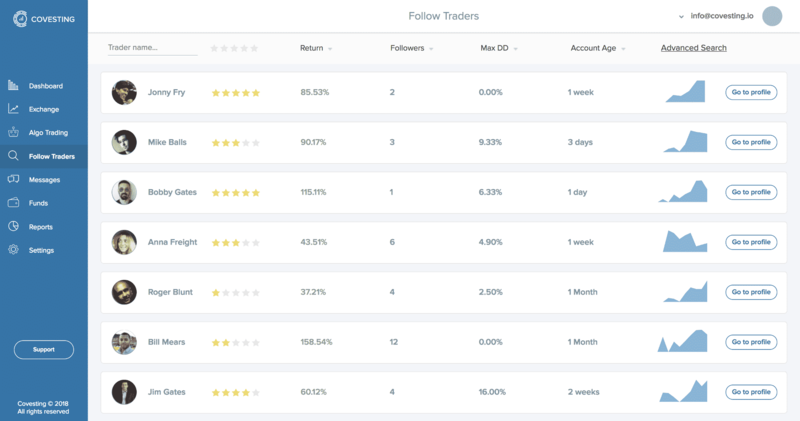 Successful traders looking at growing a following will be able to broadcast their strategies to the public, facilitating copy trading capabilities. This function allow traders to see your track record with optional Trading History available for export. Covesting has taken extensive efforts to engineer the perfect platform for users. The most vital function on the platform is the exchange section, operating as a fully functional trading terminal. As such, the interface aggregates liquidity from various exchanges and provides best prices for selected cryptocurrencies. Covesting’s development team has listened to users’ feedback and in turn developed a high frequency matching engine. Users can also take advantage of the embedded chat, which can be used to discuss current trends with other users of the platform. Cryptocurrency trading is still a new concept for many individuals. Covesting has helped fostered a unique trading environment for users of all skill levels – this perspective is on full display under the ‘Search for Traders’ section, where you can choose any among hundreds of experienced traders to follow. With so many functions to explore, Covesting’s platform stands as one of the most hyped modules to be released in 2018. This will pave the way for even more advanced trading features, such as algorithmic trading, cross-exchange arbitrage and others. Covesting is targeting Q3 2018 as the rollout for its first algo strategy. Anyway, looking forward to this platform!